Big Barrel Country Music Festival Day 2 on Saturday was an adventure for all who dared enter. The forecast was for rain and it certainly rained, and rained for most of the afternoon and into the early evening. If you were trying to avoid the big mud puddles early on, it became futile in the late afternoon as drenching rains turned the grounds into one giant pond. Still, concertgoers were prepared with their ponchos, rain boots, and jackets. A few brave souls stuck it out in front of the Main Stage during the deluge but that crowd was thin until the night. Most people headed under the cover of the Wildwoods Stage. Fortunately it all stopped falling down here in Dover around 8:00 and the crowd emerged from wherever they had been hiding. For those who did stay under the pavilion all day, they got a nice taste of acts that stray from the mainstream. This day's lineup could have performed at the Philadelphia Folk Fest. Sam Lewis brings a soulful blues sound. The Deslondes are a stripped down roots act. Caitlin Rose has an older country feel, but looks like she's ready to step into an indie rock club. The Felice Brothers have actually played the Folk Fest. Their brand of folk is full of energy and everyone participates. Nikki Lane is a singer/songwriter whose songs come across as authentic in the way she delivers them. Her latest album was produced by Dan Auerbach of the Black Keys. Of course, everyone was at the Wildwoods Stage for the last act of the night there. The “Coal Miner's Daughter,” has been everywhere, done everything, won every award, and still takes the stage to play for the crowds. Loretta Lynn gracefully walked onto stage wearing a full gown and began to serenade the packed pavilion and beyond. You don't get very many chances to see legends perform but when you do it makes you take a step back. Lynn is now 83-year-old but still sings and performs like it was decades ago. She sang “You're Lookin' At Country” and taken literally, yes, Lynn is Country. The Main Stage on Saturday was reserved for the bigger, mainstream acts. The rain kept the attendance down pretty low for most of the afternoon, but that didn't stop the artists from putting on the show for the brave who weathered the elements to see them. Young ones the Born Sisters started the day. Newcomer Logan Mize played next. Chris Stapleton brought his hard rockin' brand to the wet stage. Jon Pardi thanked everyone for sticking it out. Eric Paslay did the same, his audience took the brunt of the downpours. It all cleared up in time for Gary Allan. He was back and forth on the stage, playing it up with the crowd, throwing out guitar picks. 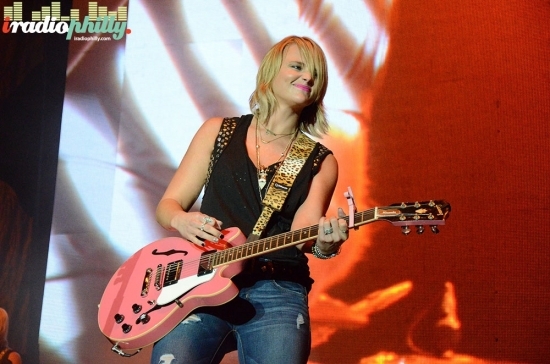 When it was time for Saturday's headliner, everyone came out to see Miranda Lambert. She was all smiles playing for the crowd, using the whole stage to roam with or without a guitar. She may be small but she is a rock star and takes over the show. This day ended a lot better than it started, and Sunday is going to be Sunny and 80 degrees. There are a lot of great acts to see on both stages all day so get out there early and make your way around.